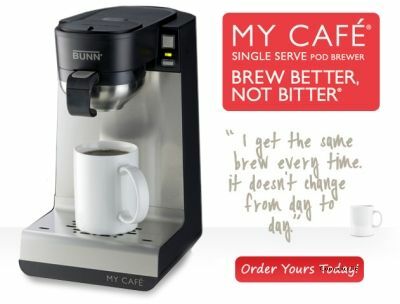 SPRINGFIELD, Ill. – Bunn-O-Matic Corporation (BUNN) introduces My Cafe, a new multi-use single cup machine that offers coffee and tea drinkers a fast yet high quality brewing experience at home. My Cafe elevates today’s popular single serve brewing method by essentially operating as four machines in one and producing cafe quality beverages with K-Cups, ground coffee or loose leaf tea, coffee and tea soft pods, tea bags, and hot water on demand. My Cafe offers consumers more choices than other single serve systems on the market today and is expected to be a very popular holiday gift this year. — My Cafe works with K-Cups, ground coffee, soft coffee and tea pods plus tea bags. — Brings more flexibility, by allowing people to choose what they want to brew for a great single cup of coffee or tea every day. — Instant hot water source for hot chocolate, oatmeal, recipes and more. — Always ready to brew coffee or tea in less than a minute, as water is kept at ideal brewing temperature in the internal hot water tank. — Unique Pulse Brew feature pulls more flavor from coffee grounds or tea leaves. — Brews coffee to SCAA (Specialty Coffee Association of America) Golden Cup industry standards. — Ground coffee drawer features a metal filter screen and holds up to 20 grams of coffee, making it capable of delivering full bodied coffee taste. — Brews 4 to 14 ounces at a time. — Reheats immediately for consecutive back-to-back brews. — Industry leading 2-year warranty is double the coverage of other machines. — Available in November 2012 at Lowe’s, online retailers and at BunnAtHome.com.